Why do financial crises happen? That’s hard to answer, but we know that private credit tends to increase before the trouble starts. But why do people take on so much debt in the first place? Is it because of wrong-headed regulation or do people become too confident – for other reasons – about how much they will be able to repay in the future? 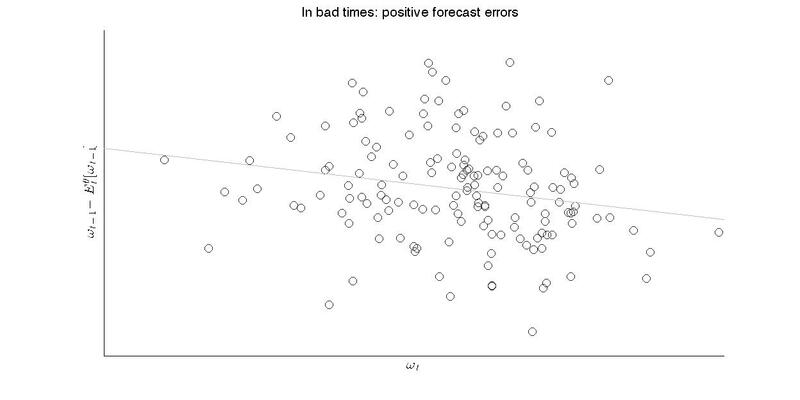 Pedro Bordalo, Nicola Gennaioli and Andrei Shleifer propose a model in which households over-interpret streaks of good or bad news and extrapolate these into the future. They show that these psychological swings can help explain credit cycles and might be a source of economic fluctuations. In the model, states of the world are represented by a random variable . The realizations determine the share of firms that will be productive – and repay their debts – in period . The representative household saves by lending to firms and takes into account the probability that some firms will not repay. However, the authors distort the household’s expectation with a psychological bias they refer to as the representativeness heuristic. People tend to take properties that are more likely in one class than another to represent that class. So red hair is representative for the class “Irish”, even when dark hair is much more common in Ireland. Agents take the change of their expectation of the future state as a sign for things to come. Biased agents judge the representativeness of state by comparing the true conditional distribution of the future state with the probability that a rational agent assigned to that state before the information on the current state has become available. The authors refer to this way of forming expectations as diagnostic expectations. When times are good, households are optimistic about the future state of the economy. The perceived creditworthiness of firms is high, households supply more capital, the interest rate falls, firms issue more debt and invest more, and future output rises. When times turn sour, households cut lending, firms issue less debt and cut investment, and the economy contracts. They don’t mention welfare, but households are obviously worse off than if they would accurately form expectations. 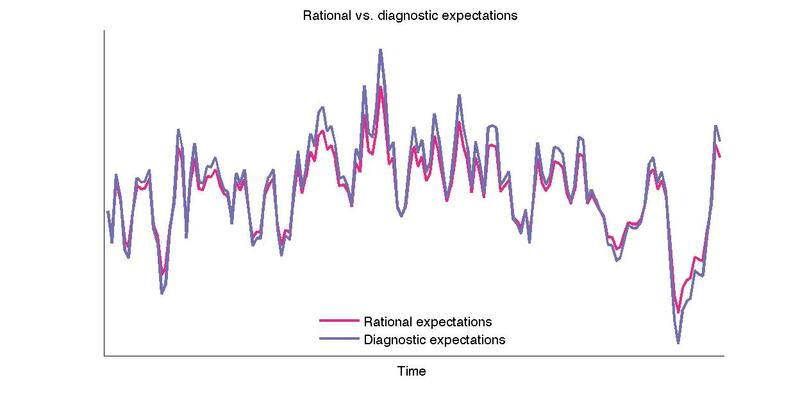 Diagnostic expectations overshoot, so they are larger than rational expectations when times are good and below them when times are bad. 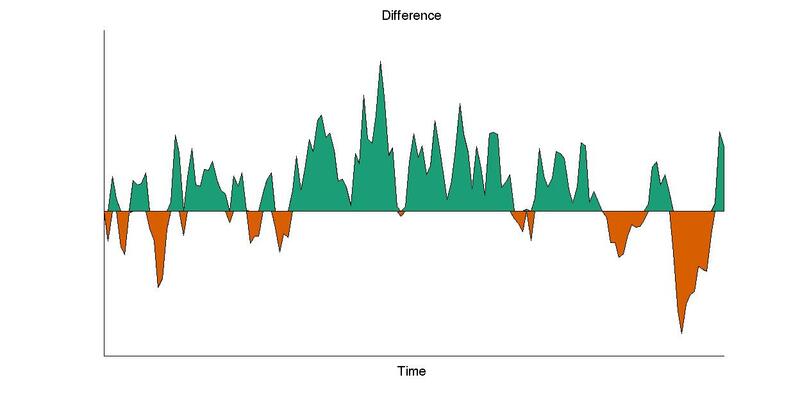 Where we can clearly see the psychological boom periods (green) and bust periods (orange). However, the signals that different people in the economy get have to be sufficiently correlated for this to matter in the aggregate. Is that realistic? If there is even a bit of heterogeneous uncertainty about which state the world is currently in, then some households might become optimistic and some pessimistic. Could this not lead to some averaging out of these effects? We must consider how to deal with the change in thinking that leads people to think we have entered a new enlightenment, changes that, through their effect on market prices, impinge on all our lives. Also, must we assume that all people form their expectations like this? What if there are some clever investors that don’t have overshooting expectations? They might arbitrage the mispricing in firms’ bond prices away, right? ASNESS: Second reason is a behavioral story. Someone out there is making a mistake. I gave you two. Underreaction and overreaction are both the behavioral story. They’re both somebody out there making an error, doesn’t mean markets are terrible by any means. I’m a big believer in markets but at the margin, they’re making an error and you take advantage of it. COWEN: Let me give you my intuition in favor of why it might be overreaction and you tell me what you think. You receive a signal about the world. It’s to some extent a private signal and you over-interpret that signal and you think it’s a signal about the whole world so you overreact. That leads to some price movement, which is propagated through time. But, at least some people think, past that 12-month time window, momentum ceases, and there’s even a bit of price reversal. Eventually, you learn that you’ve been overreacting by thinking your private information is more general, more systematic than it is and then things snap back a bit. Does that psychological hypothesis explain this mix of price reversal in the longer term and momentum in the shorter term? Do you think that makes sense or not? ASNESS: Let me take this another way. I think we are mixing overconfidence with overreaction a little bit. New news, people might be overconfident in how much they understand it, but they don’t seem to incorporate it enough. Yes, there exist limits to arbitrage for various reasons, but it would be nice if we didn’t have to assume these for the real effects of diagnostic expectations to go through. When the economy is hit by a series of good news, investors holding diagnostic expectations become excessively optimistic, fueling as in the current model excessive credit expansion. During such a credit expansion households would pay insufficient attention to the possibility of a bust. As fundamentals stabilize, the initial excess optimism unwinds, bringing this possibility to investors’ minds. The economy would appear to be hit by a “financial shock”: a sudden, seemingly unjustified, increase in credit spreads. Agents would appear to have magically become more risk averse: they now take into account the crash risk they previously neglected. Perhaps as important an advantage of our approach is that expectations are not delinked from news, but rather follow a distorted true process of the data, what we have referred to as the “kernel of truth” hypothesis. To conclude, the paper provides a theoretical explanation how overshooting expectations due to the representativeness heuristic can cause financial and macroeconomic cycles.